Each June China’s annual college entrance examination, known as gaokao, has been a required ritual for the ambitious and talented young. Even though the exam is traditionally viewed as a crucial gateway to higher education and good job prospects, the number of students taking it has hit a record low this year. “We have a new opinion [in China] that studying has become pointless. It is not easy to find a job after studying [in college], and even then, the salary you get is not high. So, many people have developed the view that studying is now pointless, resulting in declining enthusiasm for the college entrance exams.” said Cao Siyuan, CEO of the Beijing Siyuan Social Science Research Center, in an interview on NTD Television. 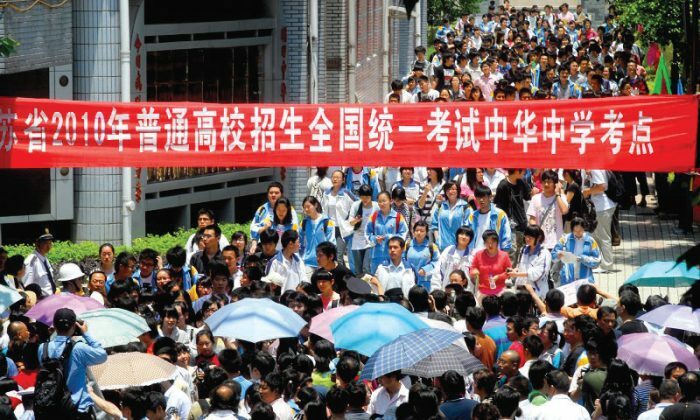 The number of exam entrants declined for the first time in 2009, and has declined each year since, from 9.57 million in 2010, to 9.12 million this year, reported the Xiao Xiang Morning News. Over the past three years, around 800,000 high school graduates have chosen not to take the exam each year, but the number rocketed to one million this year, said Chu Zhaohui, a researcher at China’s National Institute of Education Sciences. Rural students accounted for 60 percent of this number, with many choosing to give up on the exams because of the reported difficulty most college graduates now face in finding jobs, said the Xiao Xiang Morning News report. Bleak job prospects for graduates, coupled with expensive college tuition fees, are two of the main reasons students are pulling out of the exams, said Qiao Mu, an associate professor of journalism at Beijing Foreign Studies University, in an NTD Television interview. China’s recent economic slowdown may have contributed to the weakened demand for college graduates. Weak foreign demand since the beginning of 2013, due in part to the global financial crisis, has hurt many manufacturing and export industries in China, said Qiao Mu. Students from high-income families are also increasingly opting not to sit for the national examinations, as many are choosing instead to study abroad, reported Xiao Xiang Morning News. Between 2009 and 2012, the number of students who left to study abroad each year grew at an annual rate of at least 20 percent. In 2011, nearly 340,000 people left China to study abroad, and in 2012, over 400,000. This year more graduates from the Affiliated High School of Shanghai International Studies University have made plans to study abroad than have planned on studying domestically. Of its 330 graduates, 110 are recommended to domestic universities, while 140 students have been admitted to universities abroad. A generally negative image of universities in China has driven some students to study abroad. A student interviewed by Time Weekly said that he chose to study abroad because he despised the life of being a college student in China. According to him, most college students in China are known to sleep during lessons, idle their time away after school, and study at the last minute for exams. “If that’s how they treat their studies, it wouldn’t be strange for them to have a tough time finding jobs after graduation,” the student commented. Cao Siyuan pointed out that high school students from elite families who went abroad to study have said that university education in China has fallen vastly behind. The first thing that must be done in order to improve this situation, he told NTD Television, is to have colleges run by professors, not politicians. Translation & Research by Sunny Chao. Written in English by Tan Shu Yan. New security checks to prevent cheating mean female students in Jilin Province cannot wear underwire bras during China’s upcoming college entrance exams. Hundreds of students and their parents besieged a school and teachers, after proctors instituted strict procedures to prevent cheating, in Hubei Province.